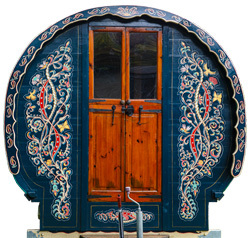 Greg’s Gypsy Bowtops provides an appealing alternative to a conventional caravan and can be used as a spare bedroom, office, studio or even a home. The wagons are sold with an IVA certificate (Individual Vehicle Assessment), issued by the DVLA. This is the equivalent of a vehicle MOT test for caravans, which only needs to be issued once in the wagons lifetime. They take approximately 5 months to build. Made from quality seasoned pine surrounded by insulation, a waterproof membrane and treated cotton canvas which is tightly tensioned around a poplar tunnel. The bed is traditionally built into the full bow width at the rear with more sleeping space below. Timber is sourced using F.S.C. Registered companies. The top quality new caravan chassis are fully braked and with the bowtop weighing less than a tonne they are easily pulled by a mid range car. Interior lighting which runs on 12 volt battery (battery not included in basic structure price). Not included in basic structure price. Interior lining – 5m x 5m needed . The interior layout can be custom built to the clients specification. We can deliver in the UK. Price on application (POA). Shipping can be organised – POA. As part of our service, we undertake canvas replacements. Personal and unique designs, created and hand painted by Juliet King. For further details please contact Greg.